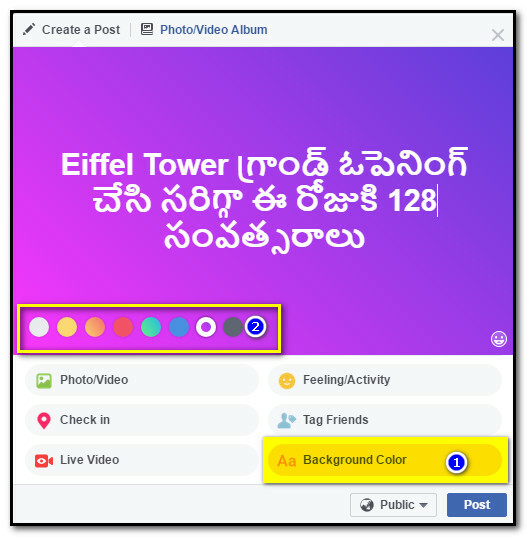 Background colored post was released on 01-01-2017 but that days its only available in mobile phones only, But now this feature introduced in Facebook Web for PC also .. Now its a new way to post status with attraction of people, But it's only for status but not taken photos or videos carry with this. Facebook is rolling out this feature Computer users also. To try this one, just click the box that says "What's on your mind?" to post or share something to your news feed, there You will see background color option click on it now you can see different color options appear below your text; now just choose or select a color to add it as your background.